Join the Chamber Alliance for a casual after-work social including food, refreshments, multi-Chamber networking, raffle prizes and E-A-G-L-E-S fun! Stop by to network and enjoy a presentation by Eagles great Mike Quick and Eagles Insider Dave Spadaro. Mike and Dave will talk about the Super Bowl run, the upcoming season and give you an opportunity to take an up-close look at the Eagles Super Bowl ring. Enter drawing to win autographed Eagles merchandise, gift cards to local merchants and gift baskets—raffle tickets available for purchase at the event. Open to the public. Registration fee: $10/person. To purchase your ticket(s), click below or pay at the door. 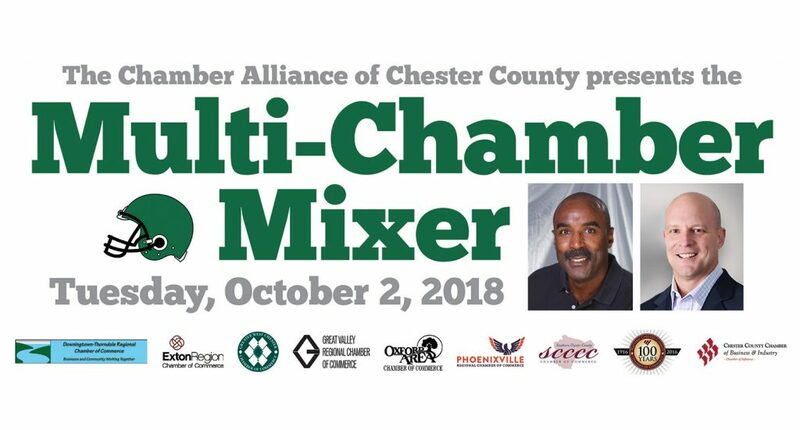 The nine Chambers of Commerce in Chester County have proudly formed an alliance working together to communicate openly and effectively support member businesses and their communities throughout Chester County.